By Maha Ellawati and Moutaz Ali. Mustafa Sharksi, who led revolutionary forces in Misrata in 2011, was reported by the army to have been captured today when the Islamist militia he was leading to relieve trapped terrorists in Ganfouda was intercepted. 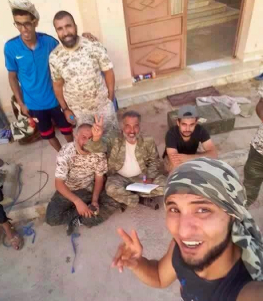 However the Benghazi Defence Brigade, of which Sharksi is the commander, produced an undated picture of him, saying he was still with his men. It added that far from being routed, as the army claimed, the brigade had overrun the army camp at the Al-Jalidiya checkpoint, 60 kilometres from Ajdabiya, capturing an ammunition depot, four tanks and various military vehicles. 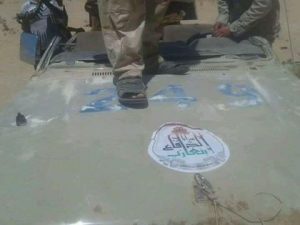 The army meanwhile produced footage of a wrecked technical clearly bearing the insignia of the Benghazi Defence Brigade. The army’s version of the day’s events is that early this morning 30 vehicles were spotted 35 kilometres north of Ajdabiya heading toward Benghazi. Units hemming in Islamist forces in Ganfouda were ordered to hold their positions. Army spokesman Ahmed Mismari told the Libya Herald that the 132 Brigade from Ajdabiya was ordered after Sharksi’s force while a unit from Suluq was sent to intercept them. Air force planes then attacked the convoy, destroying at least four vehicles, though one report hasd it that all of them were hit. When the army moved in, it said that it captured Sharksi who was taken to Khalifa Hafter’s HQ in Marj. There is also an unconfirmed report that Usma Jadhran, the hardline Islamist brother of Adjabiya-based Petroleum Facilities Guard commander Ibrahim Jadhran, died in today’s fighting. The BDB has said that the air strikes caused no casualties. This afternoon it said that it was in control of the Sultan district and fighting was continuing as it pressed on toward Suluq and Al-Magroun. If the BDB’s account is correct then they have made a daring and thus-far successful thrust which may yet relieve the pressure on the IS and Ansar Al-Sharia terrorists, along with their Benghazi Revolutionaries’ Shoura Council allies who are trapped to the south of Benghazi. However, if all the army claims are right, then it would seem that the BDB has suffered a significant setback. Adjabiya hospital said this evening that it had received three bodies, all of whom were believed to be of BDB fighters all well as several injured, from both sides.